Welcome to the From Crisis to Crisis: A Superman Podcast! This podcast has a five year mission to seek out old comics and old storylines and to boldy cover the Superman comics published between Man of Steel #1 in 1986 to Adventures of Superman #649 in 2006. You can subscribe to the show in two ways. First there is the RSS Feed and there is also the iTunes link. If you want to comment on the show or contact the hosts you can always private message Mike and Jeff, or email them at fromcrisistocrisis@gmail.com. All questions, concerns, fears, trepidations and cheap shots are welcome. The guys will try to incorporate e-mails into the episodes where possible. 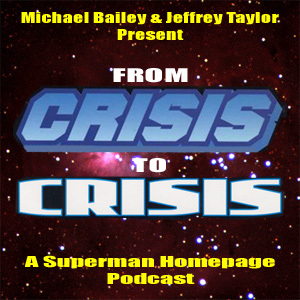 Listen to "From Crisis to Crisis: A Superman Podcast" now!